But it also features very functional and convenient storage for all of your usual items. 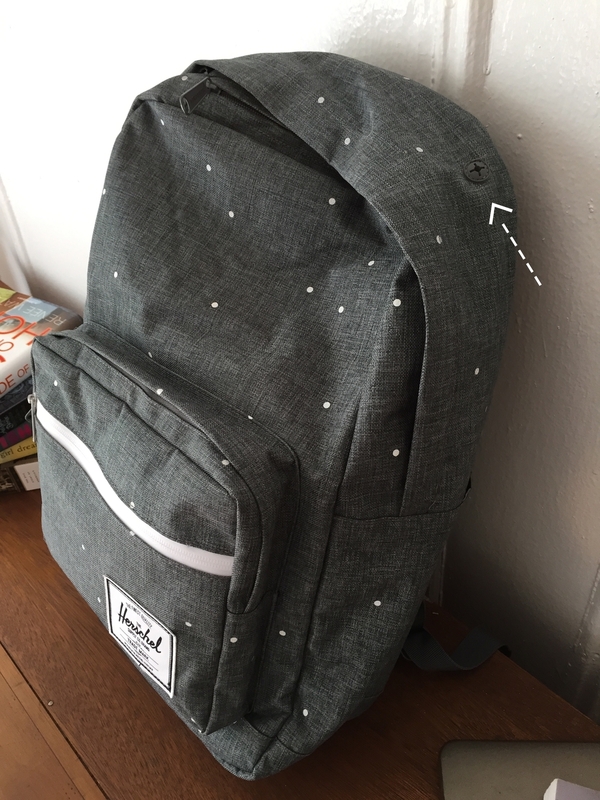 The model I chose was the Herschel Pop Quiz Backpack in "Scattered Charcoal" (this pattern is no longer available, unfortunately). The backpack retails for $69.99 Ouch! Yes, It is very pricey but considering its durable, heavy weight canvas material, it is known to withstand years of continuous use. Lets begin by admiring the logo tag attached to the front of it. See that? "The Finest Quality"? I couldn't agree more. Seriously. It feels so great, sturdy and strong. 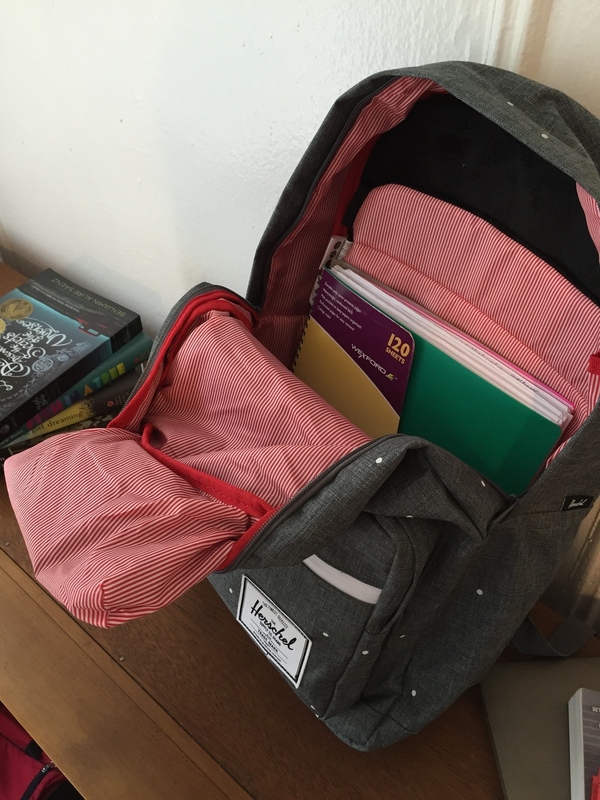 On the Herschel website they describe it as "a quintessential school backpack that features a wide range of pockets and organizers", a reason why I chose this model over the other ones they offer. If you flip that over it says "The Finest Quality"
It features a quite spacious waterproof front pocket and in it I store my lip products, small mirror and sometimes my metro card and school ID for easy access. 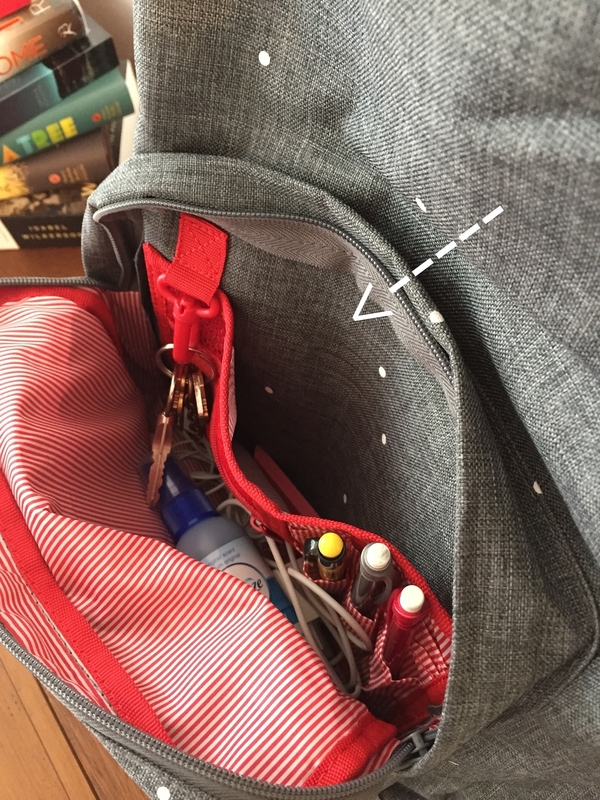 And above that one you can find a second pocket with organizers for your pens, pencils and other miscellaneous items. It is actually very spacious too, so in it I usually store my phone + laptop chargers, earphones, writing utensils, Febreze "To Go" spray, or a packet of disinfecting wet wipes. A small book may fit in there as well, or a pocket dictionary. This pocket is lined with Herschel's signature striped red and white liner plus features a key holder and an extra little compartment towards the back for smaller items. 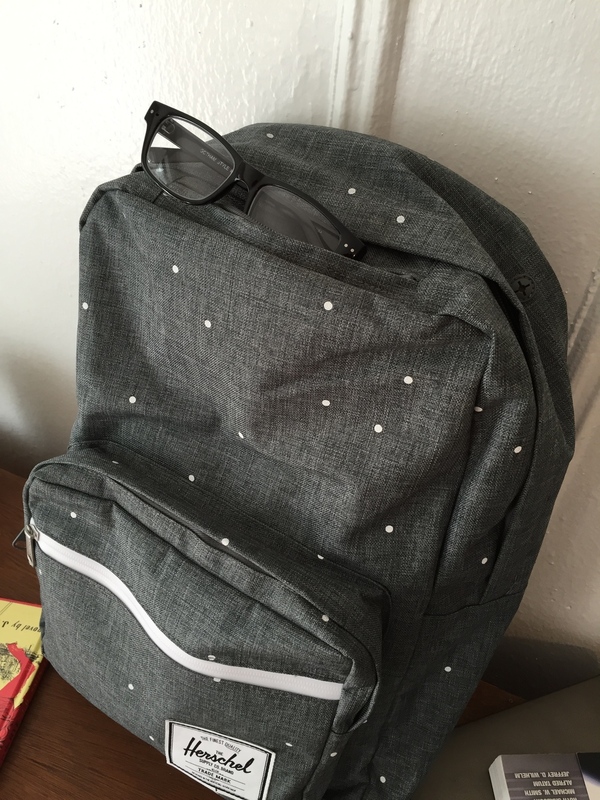 To continue the awesomeness of this backpack, Herschel decided to include a very convenient "sunglasses compartment". As a glasses user, this extra soft fleece lined pocket made me very happy. I don't always wear my glasses, (just when I can't see something far away during class or in the street) so when I am not using them, I have a protective pocket to put them in. No more broken arms or scratched lenses. Woohoo! When you open the main and biggest of all the compartments, you can see this is where the glasses are held. Also, this "Pop Quiz" backpack had me at "I feature a padded and fleece lined laptop compartment". Say what? Since I like to have the option of carrying my laptop for school or traveling I loved that this model from Herschel has a protective place for my computer friend. My laptop is 13 inches and it fits perfectly in there with a bit of space to spare (since I chose the standard/regular size backpack, not the *Mid Volume* one that is the exact same version but in a smaller scale). The standard size is targeted towards people with 15 inch laptops, really. This is so important because before buying this backpack I was debating which size to get. I chose the "Standard" size because I needed the extra space for when I take this bag traveling. I can always pack a day or two worth of clothes in there for a short trip (you know, one doesn't always want to have to carry a suitcase when traveling). 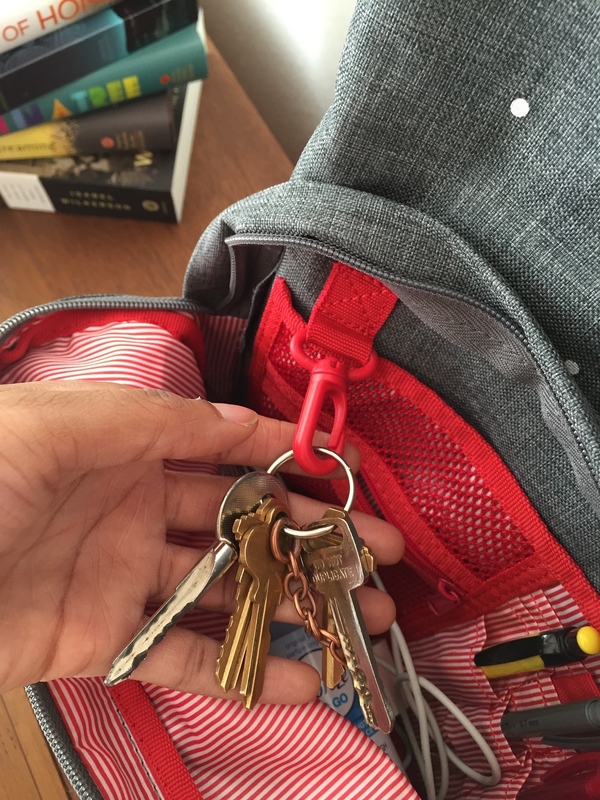 The main compartment is very spacious and fits my large college ruled 3 subject notebook, two or three medium sized textbooks, my umbrella and much more. 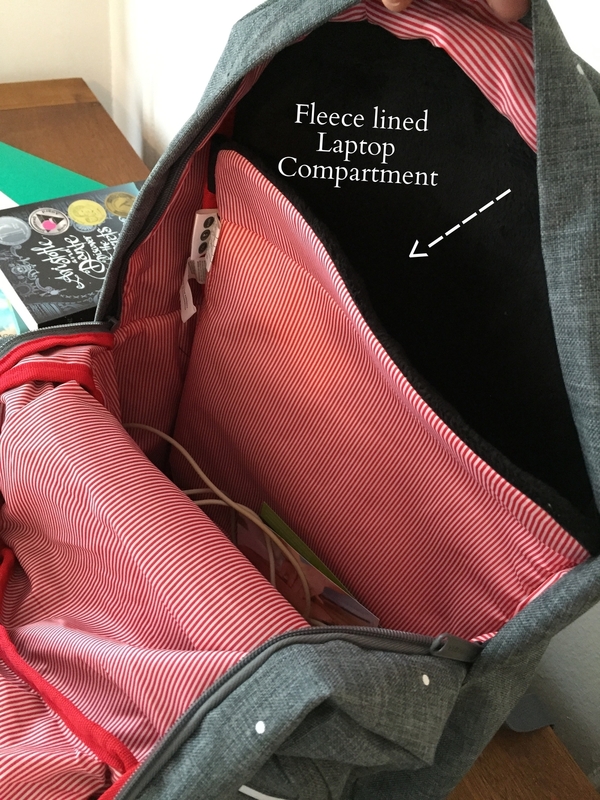 It also includes a small pocket for your phone or iPod near the laptop compartment. In short, this backpack has it all. A pocket for all of my necessary things so It definitely keeps me organized. I love all the little details and quotes throughout the bag too. For example the "Welcome to Herschel" tag above the laptop compartment and when you flip that over it says "Enjoy Your Stay". I mean, could it get cuter than this? Finally, there is even a headphone hole towards the top and conveniently placed near the pocket where you would put your phone in. I scored great with this backpack and am so glad I decided to choose this model over the rest of the Herschel collection. It fits me well and I love the "scattered Charcoal" design used. Do you notice a trend? I love grey bags. Take a look at my everyday grey cross body bag HERE, where I show everything that I put in it (my essentials).